“Music,” Robinson said, “is an inlet, and it’s also an outlet. You can bring music into yourself, therapeutically. You can bring emotions in with music, but you can also let emotions out with music,” Robinson said. So one night four years ago, when the self-professed “warm-weather person” was snowed in at her Millville home, she sat down on the floor of her music room and started to write. Her inspiration was a conversation she had with a friend — a Vietnam War veteran named Gene Morski who runs an internet radio station based in Valdosta, Ga.
She had gotten to know Morski over a period of years, during which music she has written and had produced has been played “in regular rotation” on his radio station. He had told her about a favorite spot — Corolla, N.C., on the northern end of the Outer Banks. He told her about the lighthouse, and the wild horses that roam the beaches there. That snowy night, Robinson said, she wrote “Corolla Sand,” a love song for a town she had never seen. “The things he told me, so explicitly, so vividly, began to turn in my head. When you’re a writer, and a singer, you get inspired. I became inspired by what he had told me,” she said. Robinson’s earliest inspiration came from her own family, her own home — not far from her current Millville home. “It kept us happy,” she said. She didn’t pursue her passion for music formally, but she has sung in school and church choirs her entire life, and now shares her voice, as well as songs she has written, at concerts and events throughout the area. And now she is hoping “Corolla Sand” will help carry her voice even farther. Just after Labor Day this year — four years after she initially sent the song to the tourism board in Currituck County, N.C., where Corolla is located, she got an email saying the board would like to use it in marketing promotions for the area. After much paperwork back and forth, and Robinson’s first visit to Corolla, a few weeks after that email, she has a five-year contract with the County, which will use her song — her voice, her arrangement — to promote the scenic beach area. Robinson said she is still getting used to the idea that she’s being paid for something that she does purely out of love of music. “I have a royalty check,” she said, holding up the envelope as if she doesn’t believe it herself. “I haven’t opened it, but I know what’s in it,” she said with a laugh. Despite a life immersed in music, Robinson said she never wrote her own songs until after her mother, Mattie, died in 2007. Now, she has numerous manila envelopes in which she keeps her songs-in-progress — each one stuffed with scraps of paper, or anything that happens to be available when she’s feeling inspired. Over the years, Robinson has worked with Ray Disney, a Frankford-based music producer and DJ, to produce CDs of songs she has written. She records the vocals at Disney’s Sonority Records studio. She has also developed a working relationship with a Nashville-area music arranger, with whom she shares what she envisions for each song. “I know the sound I want, I know the genre it will be,” she said. “I write my own lyrics, I write my own melody.” Then, she said, she selects each instrument she wants in the arrangement. For “Corolla Sand,” she said, she knew she wanted a pan flute, which adds a mystical, dreamy feel. For the end of the song, she had a very specific request as well: In her head, she heard the pounding of the wild horses’ hooves on the beach and wanted to replicate that. The result is a dramatic “PUM-pum-pah-pum-pum,” which Robinson said perfectly achieves the sound she was going for. “I must say, it turned out pretty good,” she said. While the success of “Corolla Sand” has been years in the making, Robinson said she has enjoyed the whole journey upon which her music has taken her. 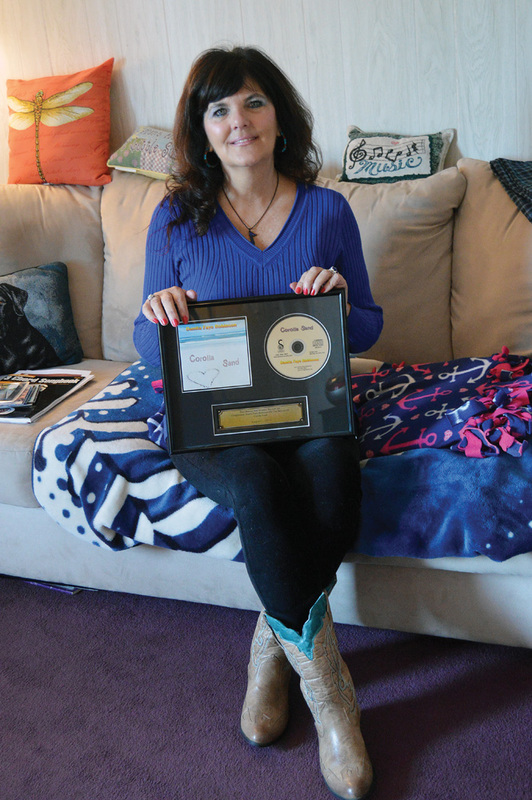 In the four years since she initially sent the song to Currituck County officials, she said, she kept following her musical inspirations wherever she found them. “You work and you live and you keep on writing and you keep on singing,” she said. Robinson said her story is proof that, in music, sometimes formal education isn’t necessary. She joked that her friends and family know that anything they say could end up, eventually, in one of her songs. They also know that her best creative time is when she’s walking around her hometown, she said.